The illustration does not demonstrate the responsibilities of the children in the family at all, whether in their childhood or later as adults. Perhaps one of the most important lessons being lost today is the responsibilities of the children in the family and in the diagram we have been looking at there is no evidence given that the children have any responsibilities. The reality is God has given every child two main responsibilities, the first is to follow the instructions of their parents and the second is to care for their parents in the elder years as they had been cared for by you in your young years. Of all the commandments given to us by God the one that comes with a promise is that of the commandment for children as we read in Eph. 6:1-3 ”Children, obey your parents because you are Christians. This is the right thing to do. “Honor your father and mother that everything may go well for you, and you may have a long life on earth.” This is an important commandment with a promise." we also see in Colossians 3:20 this truth about obedient children: "Children, always obey your parents. This is pleasing to the Lord." Obedience to your parents pleases the Lord and will bring you along life! The first elderly person I really got to know and love outside of my family was a lady I only knew as Mrs. Farmer. To this day I still do not know what her first name was. I could not have been more than 8 or 9 years old when I first wondered into Mrs. Farmer's yard. She did not live that far but a lot further than I would allow my own children to wander now. Mrs. Farmer knew all about me the moment she saw me. All I knew about her was that she was old, had a dog, and liked to take care of her flowers. Mrs. Farmer was my first elderly friend and she taught me a lot about life, though I did not know she would at the time. The first thing she taught me was all about her flowers. She taught me that some flowers started out as these little bulbs you would plant in the ground and some would start from seeds. We planted them all that first summer and we would sit out on her patio in the shade and watch them grow together. As I got older we stayed friends and she was always on my list of places to visit. Eventually she got to where she could not keep up the yard so I would mow her yard for her and when her little dog died we were both sad together. We moved when I was in the 7th grade but it was not long until I was driving to see Mrs. Farmer. Unfortunately with no one to stay with her she was eventually moved into a nursing home on the hill above where we used to live. I would go every week to visit my old friend and read to her from God's word. It was her favorite thing to do when I would visit. It was not long into those visits I realized how sad a nursing home could be. One time they moved her from one room to another and they did not bother to move her Bible when they did or several other things of hers. I had to go and find them. Many people there did not have an advocate like Mrs. Farmer did and I learned that many were lonely. It was then I started what has been a lifelong habit of visiting folks in the nursing homes and hospitals. Mrs. Farmer taught me many things but perhaps the one thing she taught me the most was the value of getting to know and love everyone no matter how young or old they are. In all the visits I have made over the years to the nursing homes I have yet to meet one person who told me that they had wished they had worked harder or longer here or there. They normally tell me of the good times they have had with family and friends over the years, we share some jokes and stories, and often I will read them their favorite Bible passages. Over the years the one thing that stands out the most is that the majority of them will go long spans of time with no visitors. Their family members are just too busy, too far, or just don't desire to visit them and so, too often than not, they die there with no more visitors than the occasional church member making rounds and the staff of the nursing home. Sadly, at least in America, the elderly are all too often sent off to a form of boarding school with others like them to which they never return home from. It is often assumed today that when God said, “Honor your father and mother that everything may go well for you, and you may have a long life on earth.” that He placed some form of statutes of limitations. The truth is He did not. Whether you are 10, 25, 50, or 70+ the command to honor your father and mother never expires. Jesus Himself was concerned for the way the people were treating their parents in their aging years. The act of Corbon was a way to get out of providing for your aging parents by committing your estate as it were to the temple though you would not lose control of how it was used until after you died. In this way they were avoiding the care of their aging parents and using piety as an excuse for what was truly breaking God's law and desire. "Honor widows who have no families. The children or grandchildren of a widow must first learn to respect their own family by repaying their parents. This is pleasing in God’s sight. A widow who has no family has placed her confidence in God by praying and asking for his help night and day. But the widow who lives for pleasure is dead although she is still alive. Insist on these things so that widows will have good reputations. If anyone doesn’t take care of his own relatives, especially his immediate family, he has denied the Christian faith and is worse than an unbeliever." "Denied the Christian faith and is worse than an unbeliever." The care for orphans and widows has always been a main stay of the Christian faith. So much so that the book of James states that the only pure religion is that which cares for the orphans and widows and keeps oneself pure from the world. How much more important then is it that we care as much for the members of our own household? Apparently to God it is of the utmost importance and is a measuring rod of the type of person you truly are. Have you seen this diagram yet? According to facebook it has been shared 7,000 times from just one person's profile and there is little doubt many others have shared it as well, just as I have done here. I have seen it shared many times by various people in the last couple days. The illustration is a good one for starting conversation, and that is always a good thing. It is also over simplified like most illustrations are and therein lies the opportunities for confusion and distortion of what the Bible does say about the family and the roles we have in marriage. I did not make the chart and since it is not given there is no real way to know what passages of scripture the person had in mind if any when creating this illustration. All too often in our day and age Christians have abandoned the word of God for Christianized verbiage or generalized assumed teachings of God without the actual word of God present. Without any scripture present in the illustration the viewer is left to, "fill in the blanks" and this is always a recipe for disaster. I do not know if that was the case when this was originally created. Perhaps there is a study associated with the illustration, perhaps there were verses to the side that have since been cut off. This is all that I have seen each time it has been shared. The best thing to do at this point is to view the umbrellas and words given in this illustration in light of scripture. 1 Cor. 11:3 says the following: "However, I want you to realize that Christ has authority over every man, a husband has authority over his wife, and God has authority over Christ." Although this passage is primarily dealing with the roles of husbands and wives in the church Paul uses this theme throughout his writings both in the church and in the home as often the church and the home were the same place. We also see this three tiered structure of authority again in Ephesians 5: 22-24: "Wives, place yourselves under your husbands’ authority as you have placed yourselves under the Lord’s authority. The husband is the head of his wife as Christ is the head of the church. It is his body, and he is its Savior. 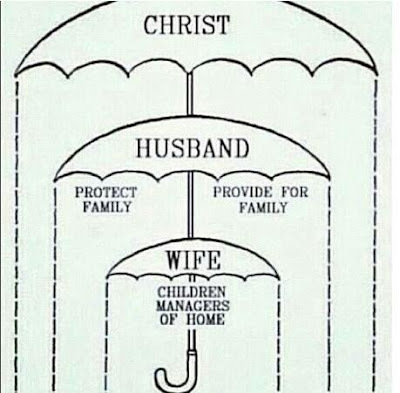 As the church is under Christ’s authority, so wives are under their husbands’ authority in everything. " We could look at several other passages but there is no need to spend more time here than necessary. We have already seen that in these passages we see that Christ is to be the head or final authority in the family. We also see that the husband is the head of the wife. The husband, the second umbrella comes with two (what are assumed to be) responsibilities. "Husbands, love your wives, just as Christ loved the church and gave himself up for her to make her holy, cleansing her by the washing with water through the word, and to present her to himself as a radiant church, without stain or wrinkle or any other blemish, but holy and blameless. In this same way, husbands ought to love their wives as their own bodies. He who loves his wife loves himself. After all, no one ever hated their own body, but they feed and care for their body, just as Christ does the church for we are members of his body. “For this reason a man will leave his father and mother and be united to his wife, and the two will become one flesh.” This is a profound mystery but I am talking about Christ and the church. However, each one of you also must love his wife as he loves himself, and the wife must respect her husband." The illustration does not indicate whether "protect family" is physical protection, spiritual protection or both. As we look at the scriptures we see that the husband as stated in vs 25 is to be willing to lay down his life for his wife just as Christ was willing to lay down his life for the church. Throughout the New Testament we always see the comparison of Christ and the church with the husband and his wife. All that Christ has done for his church the husband is expected to do for his wife this includes being willing to lay down his life for the sake of his wife. We also see in vs 26 the responsibility to also provide spiritual protection. The husband is to wash his wife in the word of God just as Christ did for the church so that he can be able to present her to God without spot or blemish. The husband is to protect his wife not only physically but spiritually as well. "He who loves his wife loves himself. After all, no one ever hated their own body, but they feed and care for their body, just as Christ does the church for we are members of his body," Here we do see the responsibility of the husband to provide or feed and care for his wife just as he would his own body. The husband must make sure that the needs of his wife are met just as his own needs are met. If he loves his wife he loves himself. At this point we see one of the first glaring problems with this illustration of umbrellas. Just as we abide in Christ and he in us so to the husband and wife have become one. “For this reason a man will leave his father and mother and be united to his wife, and the two will become one flesh." The husband and wife are now "one flesh" and as one flesh they are to be working together for the same goals with the unique gifts each has been given from the Lord both in the family and in the church. 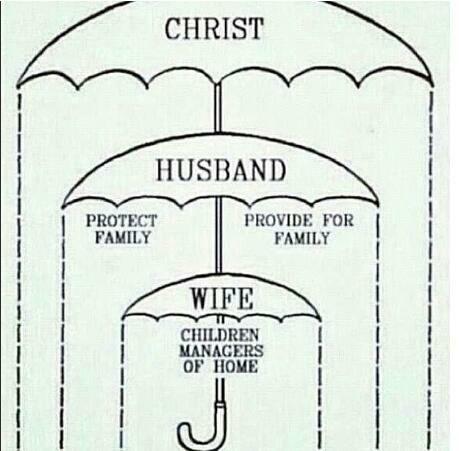 The illustration can be seen to demonstrate some of the dynamics of the family but it also does not demonstrate well that: Christ, the husband, and the wife abide as one. The illustration fails to demonstrate mutual submission. Mutual submission and love toward one another in reverence to Christ is paramount to obtain the type of marriage God desires. The illustration fails to demonstrate the mutual responsibility of the husband and the wife to provide for the physical and spiritual needs of the children as they grow into adults. The illustration does not demonstrate the full council of God's word concerning how the family is to be provided for. It is often assumed that the main responsibility for provisions for the home is to come through the efforts of the husband and is dismissive of those efforts of the wife. The Bible however gives many examples of wives who helped to provide for the needs of the home. The most commonly recognized passages concerning the wife's efforts in providing for her home come from Proverbs 31. I will not quote the whole passage but here are a few well known ones. There are other passages but the above are enough to illustrate that in scripture both the husband and the wife are capable and praised for providing for the various needs of the family. God is so concerned about the way a husband and wife treat one another and how it will affect their children that He says he will stand as a witness between the husband and wife and will not hear the prayers of those who deal treacherously with their spouse. God takes the health of the family very seriously and so should we. It is God's love for the family that shows us the importance of raising our children to love and serve him. God feels we need to have both the husband and the wife in this and so should we. Throughout scripture we see that God desires the whole family to know and serve him and teaching the children was the responsibility of both the husband and the wife. The book of proverbs was almost written entirely by a father to his son. God says in the very beginning of Proverbs in chapter 1 vs 8 "Hear, my son, your father’s instruction And do not forsake your mother’s teaching; Indeed, they are a graceful wreath to your head And ornaments about your neck. in Eph. 22:6 we read: "Fathers, do not exasperate your children; instead, bring them up in the training and instruction of the Lord." In a day and age that the family is under attack from so many fronts there are many who say a child needs only one parent and does not need both a father and mother. In my life I have been both. I have been a single parent and I have had a wife and children. The simple truth is children do miss out when they do not have both a father and mother and when they do not have both often someone else outside of the family is needed to help fill the gap. Over the years on several occasions I served as a youth pastor and then as now when we do have the occasion to go on furlough I see many churches that have operated by keeping the various age groups separated. It seams we have lost touch of our Lord's instruction and have done what has seemed right in our own eyes for far too long. As a youth pastor I often would bring the young people and the older folks together. I wanted them to be together to help and learn from one another. In the churches I have served in over the years I have often seen two mind-sets prevalent, the first is that the youth are good to have but troublesome. Regardless of where I served I was often told they were ''my youth'', hence when they did good or bad it was my responsibility. The reality is they were never my youth to begin with. They were their parents youth and they were the youth of the church and also the responsibility of all the congregation. I have also seen another attitude prevalent in the church and it was normally that of the older members. They would often feel they had done their part and were not responsible to do much but attend their age appropriate Sunday school class. Sadly often the youth and elderly were in the same boat, good to have but not much use. "But you must teach what agrees with sound doctrine. Instruct the older men to be sober, sensible, and self-controlled; to be sound in their faith, love, and endurance. In the same way instruct the older women to behave as women should who live a holy life. They must not be slanderers or slaves to wine. They must teach what is good, in order to train the younger women to love their husbands and children, to be self-controlled and pure, and to be good housewives who submit themselves to their husbands, so that no one will speak evil of the message that comes from God. In the same way urge the young men to be self-controlled. In all things you yourself must be an example of good behavior. Be sincere and serious in your teaching. 8 Use sound words that cannot be criticized, so that your enemies may be put to shame by not having anything bad to say about us. In a generation with so many without their father or mother in the home the church should be filling these gaps not dividing up into our own little groups. As fathers and mothers it is important that we take those moments to teach and instruct our children as fathers to sons and as mothers to daughters why we have the opportunity to do so for this is what the Lord intends.